MANLON - Spiral Cables are manufactured in various Wire Sizes : 0.15 to 2.5 Sq mm; Core : 2 to 26 Core ; Expandable (Working) length : up to 10 mtrs. Single core Earthing Spiral Cables are made up to 35 sq mm.Customized spiral cables & cords are also manufactured and supplied. 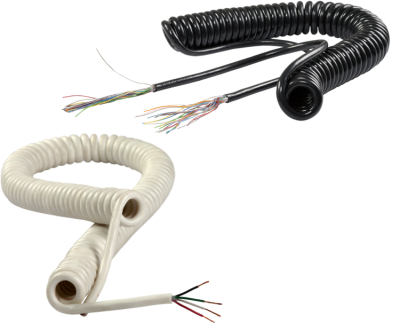 MANLON - Spiral Cables offer a longer life than typical linear cables during equipment movement operation.